Crumbs. Chunks. Cold Cat Food Trick. Tracked, Dusty, Litter. Valentine’s Day with my two furbabies and lots of pics. Wishing you all a purrfect Valentine’s Day. This entry was posted in Catch ALL page (blog), Cats, TnT and tagged Cat litter, Photography, Review, TnT, Trinity, Tyler on February 14, 2018 by KiM. New litter box follow up. I ordered two, tested both with water and went with the Catit Jumbo. This entry was posted in Catch ALL page (blog), Cats, TnT and tagged Cat litter, Review on November 3, 2017 by KiM. Dusty litter, over the top pee’ers and sloppy eaters. Looks like I just missed Internation Cat Day. So happy belated to all the felines out there. Our last house the litter boxes were more separate than they are in this house. In the new house they still access it by the (collie sized) doggie door but most of the time they choose to continually open my bifold laundry door to let themselves out. This entry was posted in Catch ALL page (blog), Cats, TnT and tagged Cat litter, Review on October 31, 2017 by KiM. 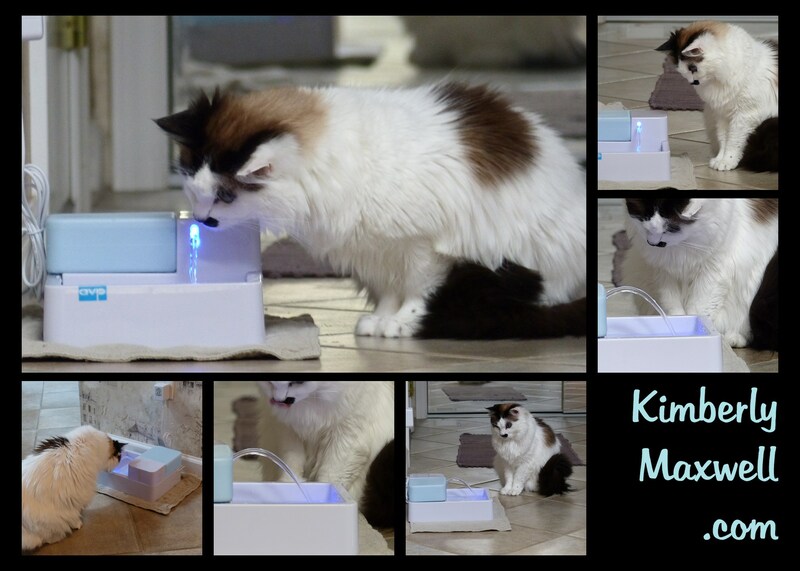 Like I wrote in my book, The Friendly Floppy Ragdoll Cat, I thought since my cats liked drinking out of the bathroom faucet that adding a pet fountain would encourage more water consumption. This was our 3rd water fountain we’ve tried and the only one, one of my cats continued to be interested in drinking from. August 2014 Trinity was diagnosed with struvite crystals. We needed to entice our cats to drink more water. Trinity also started having seizures so if I can stop the struvite crystals from forming that’s one less thing to have to worry about with her right now. It’s plastic- and that’s a big con for us. It’s BPA-free but it’s still plastic and when Trinity got chin acne within 2 weeks, I decided we’d wait until it’s made of a better material. The motor sound got louder within a week of use. I also think in all 3 fountains we tried that the motor also raises the water temp. Since Trinity drank from the stream AND from beside the stream I wish it was about 1 1/2″ wider so she wasn’t getting an ear or the top of head wet to drink beside the flow. It needs to easier to clean and put back together. The inside of mine looked nothing like the diagram. If you put it back together incorrectly, it will either pump water out on the floor or not pump water at all. It could use a little diagram for which way the pump goes in. I can see how the water reservoir will become hard to clean like my house humidifier is because where the water comes out is not at a low point so the bottom of the inside gets yucky. I’m sure you can Clorox that but if it could hold a disposable water bottle instead, or be designed so you can actually clean it all without just trying to use Clorox, or stick your finger thru the hole and scrub the bottom- then make sure you rinse all the Clorox out that’d be better. I see it looking like our humidifier with the clear plastic that I can see how it’s not possible to clean what you can’t reach. Just little things- It’d be nice to have a place to tuck the unused cord under it. I never put the one we had in the dishwasher, but really only the bottom part could be, and it will hold water in there -so I just hand washed it. Conclusion: If this was made out of stainless steel or food grade ceramic we would still have it despite the little things I wish were done differently. I would’ve lived with the cleaning hassle, and the motor sound getting louder because it did what I bought it for which was getting at my cat with crystals to drink more water. I’m not sure how I feel about the copper or plastic used inside some of the other models out there because one, I don’t want plastic used and two I’m guessing copper affects the pH or the mineral content of the water and those are important. I hope someone comes out with this in a better material soon and if it has all the other little changes that would be a plus. These are our thoughts on the product and how they worked in our home for us. Your results will vary as each cat and home is unique. I liked the idea of the fountain more than my two cats did. I even tried adding ice cubes because Trinity likes those in her water. I tried using the red laser light to get them to notice the fountain part where the water flows over the 2nd level but to no avail. I think the water in the fountain is a tad warmer than the water in their bowls, as even when it wasn’t running and moving the ice, ice dissolved faster in it than in their regular bowls. I guess that’s the motor heat? I didn’t have a thermometer that went below 80 to measure the temps. Trinity was diagnosed with struvite crystals and that prompted me to make the purchase. She’s shaved in the video from having the ultrasound performed, thankfully the ultrasound didn’t show stones. My two are scared of sounds and after a week had not taken a drink from the running fountain. Good idea, but didn’t work for us. I’ll just keep out two water bowls and continue to give water from the bathroom faucet and add water to their wet food like I’ve been doing their whole life. MY cats are scared of all sorts of sounds and have been their entire life. I’ve tried all sorts of things. They are almost 11 years old and still scared of the same sounds they have been since they were kittens. It’s just them. I love them and accept that is their personality. I’m not saying your cats would have a problem with it. This is a review of how it worked for us. ~ That is all. My review of Litter-Lifter scoops, Perfect Litter, and the Drinkwell 360. This is my personal opinions and test. Nothing scientific about them. I know we can’t all agree I just wanted to share what we are using. As they say… your results may vary. I’ve received several emails from Perfect Litter including one that says to transition slowly to the new litter (which I had planned to do), but in the box it says to clean out all old litter, wash, dry and fill w. the new litter. One of the several emails that came before the litter also said they’d call- I’m thinking that should be an option. I know some would see it as great customer service but I’d rather not get a call. It did come with an unexpected travel size Litter-Lifter scoop. Good size because I just ordered the other two and really like them. at 6min – The water fountain happened to be missing the one, 3 spout adapter. I only know because that’s the size I looked for and wanted to use. It shows it in the manual but I received two, four spouts. The snap-on clips don’t really snap on, but I guess as long as you don’t move it at all your pets can lift the cone up. If the fountain just scoots on the floor the clips fall away. I can see where that’d be a problem with dogs. It is much quieter than the Big Max but unfortunately, my cats still won’t drink from it even though they are not scared of this one. Jenny of Floppycats.com and Hauspanther have raved about Litter-Lifter for quite some time. I decided to try their scoop and boy oh boy, it is so much better than the flat tines like the one I had! I ordered both the Original and the Beamer. I like them both but prefer the Original. I like the length of the Beamer but found that the face shape on the Beamer holds a tad more litter than the Original. You really don’t have to shake clean litter off the clumps. What a time saver, and you can’t beat these for the price! This entry was posted in Cats, TnT and tagged Cat litter, Review, TnT on May 19, 2015 by KiM.